Aluminium Alloys even though being light in weight, provides excellent strength. Aluminium Pallets provides superior Weight to Strength Ratio. Aluminium Pallets are 100% recyclable and environment-friendly! 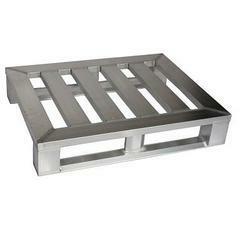 Aluminium Pallets are easily cleaned and do not get infested. They are hygienic and find extensive application in Pharma, Clean Room & Food Industry! Looking for Aluminium Pallet ?